While I’m not sure how relevant the Rock and Roll Hall of Fame is these days, it’s nice to see that this year’s nominees for induction include four women who deserved to be in the Hall a long, long time ago. 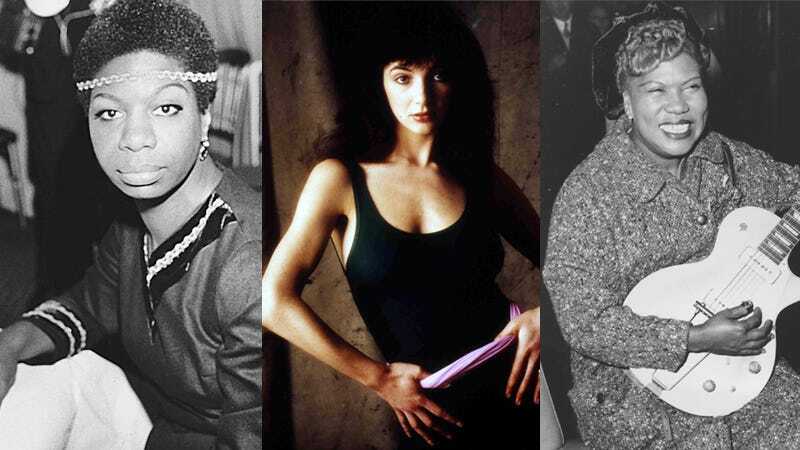 The 2018 list, alongside previous nominees like LL Cool J and Bon Jovi, includes the late “Godmother of Rock and Roll” Sister Rosetta Tharpe, Nina Simone, the Annie Lennox-fronted Eurythmics, and noted English witch Kate Bush. All four of these acts are first-time nominees. And the funk band Rufus, featuring Chaka Khan as its lead singer, is also nominated this year. Unsurprisingly, the people in the Rock and Roll Hall of Fame are mostly men. Last year the nominee list included Chaka Khan, Janet Jackson, and Joan Baez, the latter of which made it in to the Hall. The year before that Chaka Khan and Janet Jackson were also nominated. The last two female performers actually inducted into the hall before Baez were Joan Jett in 2015 and Linda Ronstadt in 2014. How artists get nominated is still a little mysterious, as it’s not based on record sales like the Grammys, for example. The full list this year includes 19 nominees, of which five of the most popular will ultimately be inducted. You can cast your votes online, which will then become part of a “fan ballot,” which will be included with the other Rock and Roll Hall of Fame ballots. While stacking these artists up against one another seems completely absurd because I want them all to be inducted, my money’s on Rosetta Tharpe, who passed in 1973. She influenced so many rock musicians, like Little Richard and Elvis Presley. When Johnny Cash was inducted to the Hall in 1992 he shouted out Tharpe in his speech, calling her one of his earliest heroes. What’s a Rock and Roll Hall of Fame—and rock and roll, in general—without her?